Big Brother JC Mounduix seems to be at it again with the rude comments. Haleigh Broucher is planning plastic surgery because of him slamming her about a flaw in her looks. JC talked smack about her and BB20 evicted Steve Arienta and his “flat nose”. Steve, the former undercover police officer, clapped back at JC Mounduix on Twitter but Haleigh isn’t handling it as well. It all started when the Big Brother Houseguests were playingsteve a “would you rather?” It was all recorded on the BB20 live feeds. 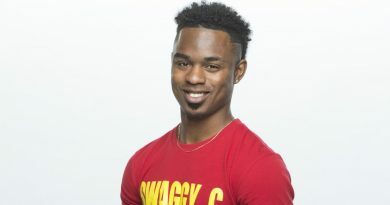 At one point, JC asked: “Would you rather have Steve’s flat nose, or Haleigh’s wart – I mean mole?” The rest of the HGs erupted in laughter but Haleigh Broucher seemed embarrassed although she had to laugh along. JC Mounduix did have one lone defender on Twitter who said the rest of the house makes fun of JC and added that the other HGs playing would you rather were also slamming each other and evicted Big Brother 20 houseguests. They all make fun of him! And did you post the rest of that "would you rather" game? They were all saying derogatory things about other past houseguests, not just JC. JC said she couldn’t have it taken off because it was too close to her eyes (it’s on her forehead up high) and she’d go blind. Haleigh laughed uncomfortably and asked, “Why are you the worst person ever?” She laughed, but it hurt and this isn’t the first time he’s harassed her about something she can’t help. BB20 Haleigh Getting Plastic Surgery? On the Big Brother live feeds, Haleigh Broucher said she wasn’t going to the wrap party and instead is going straight to the “f-ing dermatologist and get it taken off.” JC pressed on asking Brett and Kaycee to decide which they prefer. Kaycee said she’d rather have Steve’s nose. Haleigh said hers isn’t that bad because it’s up in her hairline but then said she’d rather have Steve’s nose. Brett was there too with his hair done in micro-pigtails (thanks to Sam Bledsoe). He said he “couldn’t pull off Steve’s nose” and seemed to be trying to make Haleigh feel better. Big Brother 20‘s first evicted houseguest, Steve, wasted no time firing back on Twitter once he heard about the diss on his facial feature. When Will JC’s Reign of Terror End? Haleigh said again during the HG game, “Now I’m definitely getting this removed.” This isn’t the first time JC has mocked her about her mole. He did it back when Faysal “Fessy” Shafaat was in the Big Brother house to the point that she said she’d have it removed. Fessy told her to leave it alone because he likes her as she is. Good call Fessy. JC continues to mock, harass, and torment others in the house. He touched Tyler Crispen creepily while the surfer slept – and it was enough that production considered evicting JC. It’s too late to backdoor JC this week, but Level 6 is discussing doing that soon. Haleigh might breathe a sigh of relief if karma sends JC packing and she stays in the BB20 house. Watch the Big Brother live eviction tonight and come back soon for more Big Brother spoilers and news. ‘Big Brother’ Spoilers: Tyler Targeted by Kaitlyn – Angela’s Love Admission Made Her Snap?